As we head into the summer months, new inventory begins arriving rapidly at dealerships and many customers begin thinking about purchasing a brand new vehicle of the outgoing model year. Here at Ontario Motor Sales, we have remained stocked with many new 2016 Chevrolet and Cadillac models to ensure that our customers are given as much choice as possible should they decide to enter the market during the summer months. As the #1 volume GM dealer in Ontario, we take pride both in offering you as many options as possible, and in our expansive vehicle inventory. Today, we want to highlight our remaining 2016 Cadillac vehicles, and in particular, the Cadillac ATS, a vehicle with a very special place in our lineup. Often, customers find it difficult to compare luxury vehicles. Each manufacturer spends countless hours fine-tuning their models at this level, and each is sure to consider even the tiniest of comforts that their drivers find important. Many aspects of these vehicles, like interior and exterior styling, are completely subjective, so it is difficult for us to recommend one model over another based on looks alone. That is why we have decided to put the Cadillac ATS up against some of its fiercest competition: the BMW 328i, Audi A3, and Mercedes C-300, and have compared them on some more finite details. The Cadillac ATS offers the best standard warranty package with 4 years/80,000km basic warranty and a 5 year/160,000km powertrain warranty. Audi and Mercedes both compete with 4 year/80,000km basic warranties (like the ATS), but maintain the 4 year/80,000km offering on their powertrain warranties as well—a disappointment for those looking for a little extra peace of mind. BMW also offers a 4 year/80,000km warranty and gives their powertrain a 4 year/160,000km warranty, improving upon Audi and Mercedes in kilometre allowance, though it is still unable to match Cadillac's 5 year guarantee. Chalk this up as the ATS's first win. The 2016 ATS also outmatches its competitors in performance. The ATS 2.0L engine boasts a stunning 272 horsepower. The Mercedes C-300 finished a distant second with 241 horsepower, followed closely by the BMW 328i's 240 horsepower. Finally, the Audi A3 sports a 220 horsepower engine, which is still pretty quick but over 50 horsepower weaker than our Cadillac. What's most impressive is that the ATS 2.0L engine still performs very competitively in fuel economy too, getting a combined 9.6L/100km fuel range. That is a close finish behind the BMW's 8.9L combined rating and Mercedes's 9.0L rating. Even still, Cadillac outperforms the Audi A3 in both performance and fuel economy, since the A3 burns the most fuel at 9.6L/100km combined. If you average out the speed you get with the ATS and consider the competitive fuel economy ratings, we would say that that's two wins in a row for Cadillac. While every vehicle in this segment offers remarkable tech features, Cadillac once again takes the win with almost every vehicle in our 2016 lineup offering Apple CarPlay and Android Auto. Mercedes and Audi have announced plans to add these features in some 2017 models (albeit not in their vehicles in this particular segment), while BMW has not officially announced plans to incorporate either in their vehicles as of the time of writing. You can see a list of models that offer Apple Carplay by clicking here. Of course, the ATS also comes standard with CUE, our award-winning touchscreen infotainment system that puts your phone, audio, and nav functions right at your fingertips. Have you read enough yet? 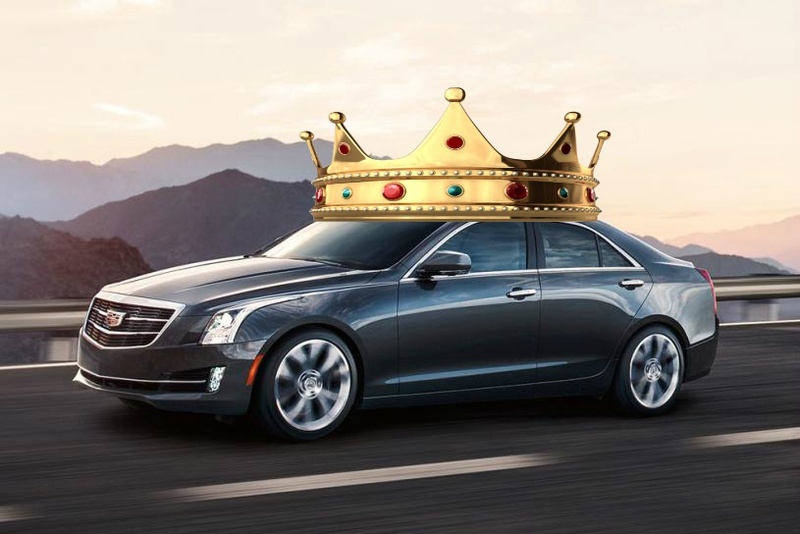 These are but three of the biggest ways the 2016 Cadillac ATS outperforms its competition. We haven't even gotten into ride-handling or other premium features that the ATS offers over its competitors, but you get the idea!